Blue Sky Apartments are located at Turtle Beach Resort in Mermaid Beach. Ground floor apartment with large sunny patio which is just a short walk to the new refurbished pool area with water slide and close to tennis court. UNLIMITED High-Speed Wi-Fi. Bring your own Netflix/Stan/Foxtel details to stream on the 50" LED LCD Full HD SMART TV or watch on several of your own devices at once. Spacious fully self contained apartment including full kitchen with oven, cook top, dishwasher and microwave. Fully equipped laundry with washing, dryer & clothes airer. 2 bathrooms including ensuite with vanity basin, toilet and enclosed shower. Shower over bath in main bathroom, with full laundry facilities. Reverse cycle air-conditioning in living area, fans in bedrooms, and large sunny patio. SPLASH ZONE IS A FANTASTIC AND FUN WATER PLAY GROUND WITH 4 WATER SLIDES, 2 TODDLER SLIDES, DUMPING BUCKET, WATER CANNONS AND MORE! ALL FREE!!! The Resort features tropical gardens surrounding lagoon pools, wading pools, lap pools, spas, children's water park and interspersed with free barbecues. From the moment you arrive in this subtropical oasis woven around a wonderful lagoon setting, the emphasis is on the simple pleasures of your privacy, calm, relaxation and effortless enjoyment. Breezy balconies and terraces offer uninterrupted views of lush tropical greenery. You can also enjoy the use of the floodlit tennis court, gymnasium, sauna & spa, taking in a movie in the resorts 22 seat cinema, free playground, even play a round on the 18 hole mini putt putt course. Unlimited Tennis & Mini Putt Golf when you hire a fun pack from us which includes mini putt equipment and tennis equipment available at $30 for the whole family for your entire stay payable in cash on arrival. Just book in at reception for tennis and just jump on the mini putt green to play. If possible please advise prior to check-in if you require this fun pack. Equipment is not available to be hired from reception. Equipment is not available to be hired from reception. 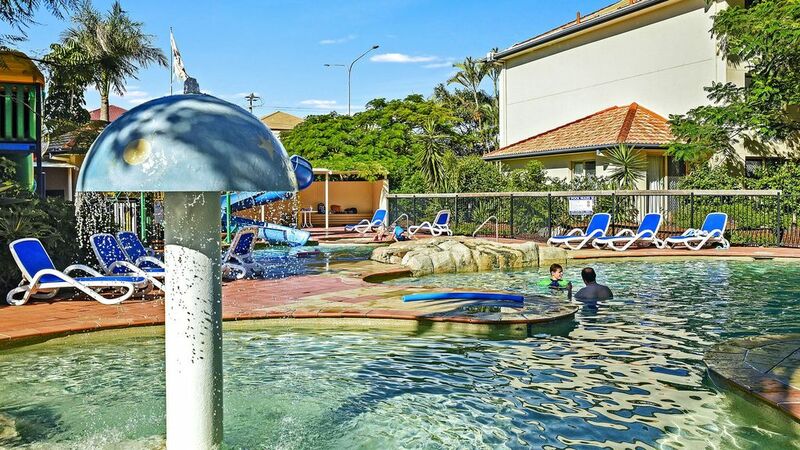 Experience the holiday of a lifetime at Blue Sky Apartments at Turtle Beach Resort, the magnificent subtropical oasis set like a glittering jewel on the fabulous Gold Coast. The resort atmosphere is family friendly and casual, the facilities extensive and absolutely first class. Immerse yourself... in a truly unique holiday experience on The Gold Coast of Queensland Australia. We offer a great personalised check in and take you to your room and for check out you simply drop your keys in our “Blue Sky Guests” letterbox by 10:00am. If you arrive early after a previous guest checks out at 10:00am we can arrange to store your luggage for you in your apartment as our guests cannot store luggage at reception. Splash Zone Waterpark with 4 water slides, 2 toddler slides, dumping bucket, water cannons & more. Height restriction are monitored for safety of children - approximately maximum 145cm tall. Unlimited High-Speed Wi-Fi $20 applies on all bookings. Extras: Porta-cots, Baby hi-chair, and basic Stroller are available for hire at a low cost which will be ready in your apartment when you arrive. Please contact us for prices if required. Fees payable in cash on arrival and must be ordered 1 week prior to check-in. You can use your tennis equipment as often as you like for your entire stay by just booking in at reception as no further fees apply. Rates are based on 4 people. Maximum 6 people allowed. Extra person charges apply which includes a single fold-up rollaway bed with a 10cm thick mattress and all linen suitable for adults too. Extra persons are charged for ages 3 years and older $33 per person per night. If you have an infant do not add them into the number of guests otherwise you will be charged. Blue Sky Holiday Group is an offsite real-estate agency that owns and manages privately owned holiday apartments at Turtle Beach Resort. We have no affiliation with the onsite manager as we manage the apartments ourselves. Late Arrival Fees: $30 for arrivals 5pm-8pm / $50 between 8pm-10pm, $70 after 10pm and $100 after 12:00pm. This is payable in cash on arrival to the check in person on the day. If this is a concern we maybe able to organise you to collect keys from a safe box which is offsite & 5 mins drive away. Also there are no charge back facilities to your room and no access to kids club. Glen and Nicky created Blue Sky Holiday Group 11 years ago starting with 1 apartment and then purchasing an additional 3 apartments over the years in this resort and then another apartment at Diamond Beach Resort. With our experience and knowledge we always try to make sure our guests are looked after along with the apartments as well. Our prices are generally always cheaper and this has allowed thousands of families like us to afford to stay in a great family resort and so other families wouldn't miss out! This apartment is set on the ground floor which has easy access out into the resort to the pool areas, BBQ picnic area or to the tennis court. In a quiet area with a large spacious patio for children to play on or for you to just sit and relax. Ground floor sunny patio where children can play or relax just outside your apartment living area in the sun. You and your children have easy access to the pools, and mini putt from this patio with just a short walk. Washing Machine, Clothes airer & Dryer in Main Bathroom plus laundry sink. All linen is provided except Pool Towels which are available to hire for $3 each for your entire stay. Please advise if required. Bath Towel provided per person. Full Kitchen with oven, cook top, microwave and dishwasher. The property /resort would appeal to everyone - loved the adults only pool and all the other pools. Location good BBQ close n clean awesome. Love the set up of the apartment just a little up date on the showers and second toilet may need new loilet seat it make the look dirty even though its not ,other than that lovely and I will diffently book this apartment again. Thanks for the great review. Yes I noticed it needs a new toilet so getting that done when it’s vacant in the next couple of weeks. We look forward to hosting you again for your next holiday.